A boozed-up taxi-passenger smashed the window of a cab and threw himself out of the moving vehicle after he feared he was being taken prisoner during a fare row. 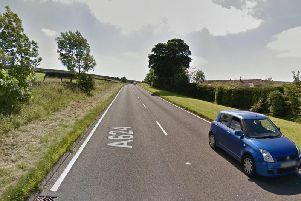 Chesterfield magistrates’ court heard on Tuesday, June 12, how Joshua Daniel Parfitt, 28, of Welbeck Road, Bolsover, was left covered in blood, cuts and grazes after he admitted causing criminal damage to the taxi’s rear window in Chesterfield. Prosecuting solicitor Mark Fielding said: “It is right to observe he broke the window seeking to escape from the taxi after a drama between him and the taxi-driver. “The defendant was in drink and he hailed a taxi or arranged for a taxi to take him home. There was not quite enough money to complete the fare, according to Mr Fielding, and the defendant offered to pay the difference on arrival at his home but the taxi-driver did not agree. Parfitt panicked and started to try and unlock the taxi, according to Mr Fielding, and he was injured in a struggle and he put out one of the windows and escaped. Tree surgeon Parfitt, who is of previous good character, pleaded guilty to causing criminal damage after the incident about 3am, on May 20. Defence solicitor Karl Meakin said: “Both parties clearly had some level of blame for what took place. Mr Meakin added that the taxi-driver had escalated the row “beyond the pale”. Magistrates sentenced Parfitt to a 12 month conditional discharge but warned that if he commits another offence in the next year he will be re-sentenced for the damage with any new crime. Parfitt was also ordered to pay £85 costs, £50 compensation and a £20 victim surcharge.